Shenzhen, China – September 28, 2018 – ARM Development Tools Distributors Meeting was held in Macau on September 19th, 2018. Hosted by DSG department of UK ARM Company, a total of 20 ARM authorized distributors in Asia-Pacific region participated in this meeting. 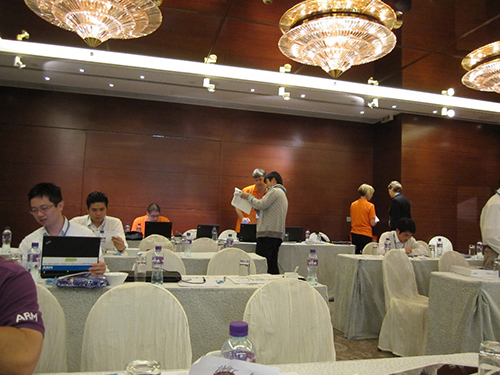 MYIR Tech attended this meeting as the official authorized distributor in China. From 32-bit ARMv7 platform to 64-bit ARMv8 platform, they cover many cross-age technologies such as intelligence, computing, security, graphics acceleration and parallel computing. ARM keeps driving the most popular fields of computer science and technology such as artificial intelligence, machine learning, IoT and embedded forward by leaps and bounds. ARM has completed the shipment of 100 billion chips from 1991 to 2017, and will complete the shipment of another 100 billion chips in the next 3 years. ARM’s technology is everywhere in our lives, opening a new era of intelligent interconnection. ARM tools are the most important part of the ARM ecosystem, including compiler, debugging, verification and other auxiliary tools. These tools help developers complete their work on ARM platform better and faster. As one of the most important partners in Asia-Pacific region of ARM, MYIR provides distribution, technical training and support for engineers in China, helps ARM Company on providing better service to China’s semiconductor industry. 1. Software development tools: DS-5, DS-MDK, MDK-ARM, MDK-PLUS, RVDS, Keil C166, Keil C51, Keil C251. 2. Simulators: DSTREAM, RVI&RVT2, ULINK2, ULINKpro, ULINK-ME, ULINKPRO-D.
3. ARM Versatile Development Boards: development boards based on ARM9, ARM11, Cortex-A5, Cortex-A7, Cortex-A8, Cortex-A9, Cortex-A15, Cortex-A53, Cortex-A57 and the latest Juno development board. 4. KEIL Development Boards: development boards with NXP, ST SoCs based on ARM7, ARM9, Cortex-M0/M3/M4. 1. ARM CPU modules/ARM development boards/ARM single board computers: boards based on ARM9, Cortex-A5/A7/A8/A9, etc. 2. Charging pile charging control unit, charging pile overall solution. 3. Custom design services based on ARM solutions.